The entire country is talking about only two films at this point: Salman Khan’s Bajrangi Bhaijaan and SS Rajamouli’s ‘Baahubali’. 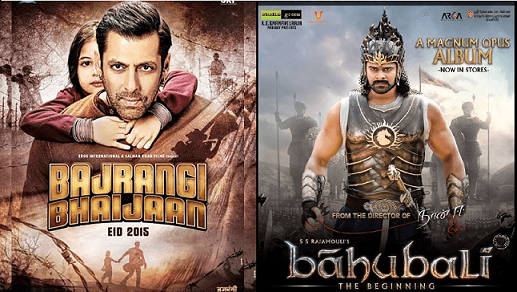 Now an interesting discussion has come up regarding which film wins the box office race among these two? Here is an analysis that indicates Bajrangi as the winner with a slight margin. Baahubali was released on July 10th and has minted more than 350 crore at the box office so far. Opening on day one with over Rs 50 crore globally, it breached 100 core mark by the weekend and has collected Rs 215 crore globally in first five days. On the other hand, Salman Khan’s Bajrangi Bhaijaan opened with Rs 27.25 crore at domestic box office and by the 5th day, it has raked in Rs 151.crore at domestic and Rs 69 crore at international box office to take the tally to Rs 220.10 crore globally. The result might differ as the journey goes far but for the first five days, Bajrangi Bhaijaan beats Baahubali as they stand at Rs 220.10 crore and Rs 215 crore respectively at global box office.